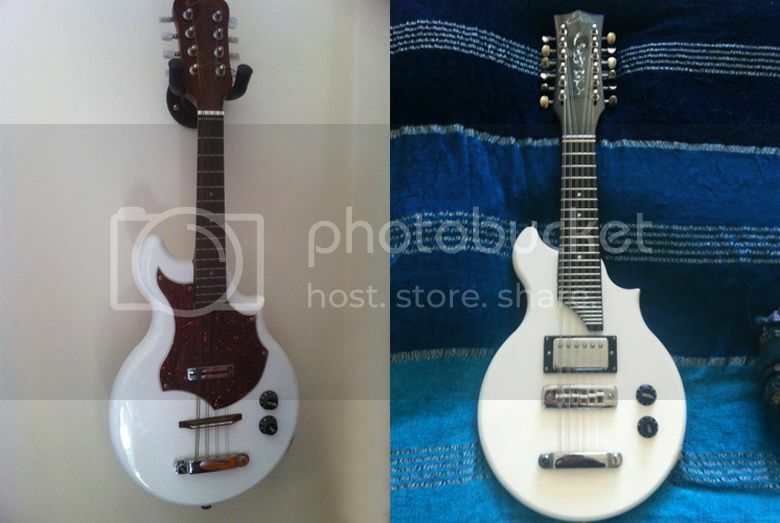 Currently being auctioned on eBay UK are an Eko solidbody 8-string mandolin and an Eko solidbody 12-string mandolin. The latter is essentially an octave 12-string guitar (I used to have one myself), almost certainly influenced by the now legendary Vox Mando Guitar, and usually tuned a whole octave above (modern) 12-string guitar tuning. I'll let you know what these Eko mandos fetch on eBay when the auctions end. I'm afraid my fingers are far too sausage-like to ever play that 12-string. Probably sounds cool, though. I have a similar problem with these tightly-positioned frets. Best leave the mandos to those with small hands/slender fingers, I think. I like the 12-stringer. I would actually prefer the Mandotar, but that might be on aesthetic grounds. I wonder: would the humbucker sound to muddy, or would the single-coil sound too shrill? Looks like a Maton Ibis!